The advanced technology of a new scanning electron microscope at The University of Toledo allows a person to see details of the hundreds of lenses in the compound eye of an ant, much smaller than a grain of sand. The College of Natural Sciences and Mathematics acquired the technology, which can magnify up to one million times to see nanoparticles, with a $550,000 Chemical Research Instrumentation and Facilities Grant from the National Science Foundation’s American Recovery and Reinvestment Act. The scanning electron microscope, located in the UT Instrumentation Center in Bowman-Oddy Laboratories, is used not only by University faculty and students, but also by area high school students through a new outreach program that implements cyber-infrastructure to virtually bring this instrument into the classrooms. “If we can’t bring the high school students to the instrument, then we will bring the instrument into the classrooms,” said Dr. Kristin Kirschbaum, director of the Instrumentation Center. 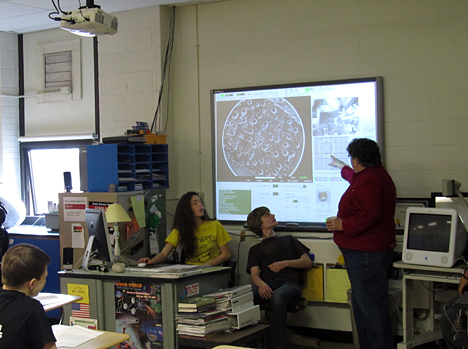 Kathleen Singler, a science teacher at Ottawa Hills High School, used UT’s new scanning electron microscope to teach her ninth-grade biology class this spring. The SCOPE (Science/Scientists Changing Our Precollege Education) program provides teenagers with high-quality education experiences to generate interest and proficiency in science. The SCOPE program, which works with Ottawa Hills High School, is forming relationships with Central Catholic High School and the Imagination Station in downtown Toledo. Kathleen Singler, a science teacher at Ottawa Hills High School, who leads all the ninth-grade biology courses, said she was excited to be able to share resources with the University and allow her students to experience the technology. The students first used the microscope to look at various powders, such as sugar and talcum powder, to discover what type was left at the “crime scene” of a science exercise. The class also used the microscope to identify bacteria cultures and a lab involving single-cell organisms, Singler said. The scanning electron microscope, as the name implies, uses electrons instead of light to magnify the images. It can be operated remotely through a computer program, and a camera allows its work to be watched live via the Internet. Dr. Stefania Messersmith, a lecturer at Bowling Green State University, has used the microscope in the Instrumentation Center remotely from BGSU to advance the learning in her analytical lab there. One of Singler’s students also used the microscope as part of a science fair project working with diatoms, a unicellular type of algae. Dr. Dean Giolando, UT professor of chemistry, is involved with photovoltaic research and said the scanning electronic microscope has the ability to look at the individual, thin layers of a solar cell to make sure they are uniform. The microscope also has special attachments: an EDS detector that helps identify the elements in the subject, a STEM-detector that allows viewing samples in a transmission mode, and an EBIC detector that can show the flow of the current and thereby identify defects in semiconductors. Prior to the scanning electron microscope, which was installed last year and began use this spring, the Instrumentation Center had an older machine that used film, which limited what could be shown. This entry was posted on Monday, July 18th, 2011 at 10:20 am and is filed under Uncategorized .